Daily Account of a Friend, Daughter, Sister, Mommy and Wife on her journey towards living, learning and loving. This blog also speaks of music, hobbies, interest, gadgets, travel and food. Thank you for visiting my blog. I am a newbie so I would really appreciate it if you can link me to your other friends who can share with me the same interest and passion. I hope we stay connected in order to grow and learn from each other as we journey the road towards discovery and learning through blogging. WHEN THET SPEAKS: Unbounded.Uncensored.Unsuppressed.No Rules.No Non-Sense. Allow me to share with you President Corazon Aquino's speech before the US Congress shortly after she became the 1st woman President of Asia and the Philippines. Thanks to NinoyAquinoTV for uploading these videos on YouTube. I was on my way home from the office at around 5:30 in the morning, waiting for a bus ride enroute to the South at Buendia, when vehicles from a giant TV network hurriedly passed through where I stood. I have a gut feeling that something must have happened to the well-loved Tita Cory because the vehicles were heading towards Makati Medical Hospital where she has been confined for the past few weeks. I immediately turned on the TV when I reached home, found out that my gut feel proved right, sat down filled with deep emotion of grief and looked back on how, once in my life, Cory Aquino touched my soul. I have never met her personally, there was an occasion or two that we could have crossed paths in the 90's during my active involvement in social development work, yet her impact on me personally, like the rest, is unfounded. It was 1986, I was a sophomore from a Jesuit school in Naga, when EDSA revolution uprooted my social consciousness from a passive observer to an active member of the society. As a student from an Ateneo school that is committed to its role as a catalyst for change, we were challenged to take part in guarding the election. I was a first time voter, obliged due to peer pressure, there we took vigil at Naga Comelec precincts as a Namfrel volunteer. Initially, there were reservations, colleagues were picked up by military, our school was under the watchful eye of the Marcos administration, yet our spirits were undaunted and unperturbed. When there is a collective effort to fight for justice, the passive spirit became alive especially if the guiding force is a woman, a mother and a moral leader. When Marcos proclaimed victory in the snap election, many tears rolled not by defeat but of an intense desire, we believe, it was about time to fight for what is right and moral. During EDSA revolution when people gathered in Manila offering bread and flowers to the armed soldiers, we were doing the same in Bicol. I learned later, the whole country was one in spirit and prayers in attaining for true democracy. When Marcos fled the country and Cory took oath as president, the moment was magical. I remember fondly that I was at home when news broke out about the people's power victory. People outside my home were jumping, shouting, crying and thanking the Lord aloud for gaining democracy through a peaceful revolt. Indeed, it was a sight to behold! When everything settled politically and socially, as a student, I became involved in the school's social organization and activities. Ateneo believes that it is integral to become a man and woman for others, that change could take place if people are one in principle and vision. It was the path I headed after college, for 12 years I was committed to social development with Cory guiding as light, to a work resented and viewed by others as financially unrewarding, especially from people who don't know where I am coming from. However, when there is moral satisfaction and spiritual fulfillment at work, it is unquestionably rewarding than money could offer. So to my guiding light and inspiration, Tita Cory, may you continue to watch upon us, pray over us and remind us to never forget your legacy of piety, moral leadership and patriotism. Thank you for a job well done. Farewell! Logging in to YouTube, mind set only to one search, I listen endlessly to only one voice. A voice that gave me goosebumps and made me teary-eyed, no matter how many times I've heard her sang. It is a voice of an angel in disguise. In moments like these rays of sunshine dominate darkness. And then, looking back, her life was most likely stripped bare from an empty shell. She grew up not into a whole family, merely depending but on one parent. She survived not dependent on others, but her God-given talent made its way, at least, to put food on the table. At a young age, she had come across with defeat yet bounced back with vengeance. I think of this little girl, so willful, and wonder how she defied the odds. In some ways, hardships became her strength and the will to survive became her key to success. I think of myself, of supportive family around anytime, of food around the table, of joy found in sorrow. It is more fortunate than what this little girl had endured. In life, indeed, it is true that you will emerge victorious when you brave life with strength, fervor and faith. Oh, how she sings! I hear the echo even now. And it's louder than words. Her songs echo in my heart - for that is the hope that I carry inside. And the little girl??? CHARICE PEMPENGCO! For two days now, I am stuck at home due to non-stop raining and continuous flooding in our village. I hate it when it is raining! It made me feel gloomy and restless. I hate it even more because I could not help but remember my mother's last hours on earth. It was the 3rd of November 2000 when super typhoon Reming hit the country. According to reports, it was one of the most destructive tropical cyclones in terms of casualties. Many properties were destroyed and many lives perished, my mother included. I could vividly remember that it was around midnight when typhoon Reming's wrath unleashed its power. It continued raining hard together with strong winds until morning. My mother who was bedridden due to a non-fatal illness was staying on the 1st floor. My father, hubby and me were in chaos because the flood was already knee-deep inside our home. I could not even recall how we were able to rescue our furniture from submerging in water, all of these happening sans electric power. Our lights were coming from small little candles! From time to time, we were to take a look at how mama was doing. She seemed restless but was doing all right, though we need to alternately fan her because she could not breath and was running out of oxygen. This seemed natural because she could not live without the electric fan turned on at its full blast. It was so unsuspecting of us that those moments would be her last. It was around 5am when the the rain stopped so I had to look at my then 3-year old son who was sleeping alone upstairs. I fell into a deep sleep when my younger sister who was 5-mos pregnant went to me at around 7 am and said that mama was gasping for breath. There was denial on our end ---she could not come near her...I could not...my father, too. It was my hubby who came near and held mama's hands. It was him who saw mama took her last breath. Fortunately, he was able to pray with her on her dying moments. We were trying to reach for a doctor inside the village, in an attempt to possibly revive her, but the flood was so high that only a ten-wheeler truck could passed through. She was declared dead at 10am though she actually expired at 7am due to complications from high blood pressure. In hindsight, if only there was no typhoon...if only there was no flood, could it be that my mother is still alive? NOW, can you blame me if I hate rainy days???? She first caught my attention when I watched Regine Velasquez's "Roots to Riches". She was a nobody when the show started yet look at how life take its course. After the show, she was not left unnoticed. It is not her voice. It is not her persona. It is her life's drama that generated a captive audience. We, Filipinos feel for her struggle. Her pain. Her poverty. Her battle as well as her success and failure. We could identify with her because she represents us. All of us could be Evas. Perhaps that is the reason why she has a growing follower. When I heard her sang "Minsan ang Minahal ay Ako" (Once I was Loved) on SOP, I really felt the intensity of her emotion. I could feel her pain through the song's lyrics. It is a known fact that she was a singing champ, not more than once defeating Regine Velasquez, the Asia's Songbird. Unconsciously, the song could have hit her hard. It could have hit others, too, who are on the same road she had taken. I want to share with you her song, so like me, you can get some thoughts on life, too. An aftermath of her performance dawned on me that songs are invented to musically present life in every form. Each lyric has a thought, each melody has an instrument, each song has a lesson and each Eva Castillo is a SONG to remember!!! I got a phone call from my father last night. How I really miss him! He migrated to America in 2004 and settled in the busy district of Los Angeles together with his siblings and mother. Yup! My Lola is still alive and healthy at 93. 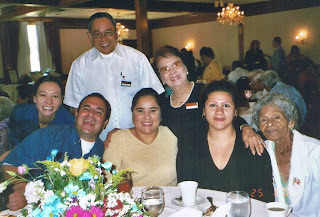 Papa is the eldest among 8 children and is now turning 72 on November 16. 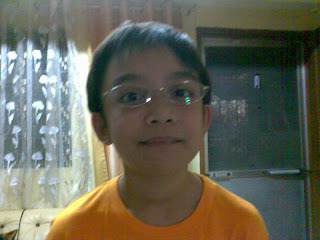 Anyway, he called to say that he is now eligible to file for American citizenship this July. I could sense that he's excited since he can now enjoy the perks of being a US citizen aside from the health insurance and medical benefits he's enjoying as a green card holder/senior citizen. I am truly happy for him! He is not affectionate and showy as a father and he could be as cold as ice sometimes but he is a good father and a good husband. He was never unfaithful to mama until the time of her death. For me and my only sister, that is most treasured. As his first born, my sister agrees that I am his favorite. True or not, one thing is sure: I am my father's daughter. And our tie cannot be separated by distance nor time! As I was contemplating on what to write today, I asked my son for suggestion. "Why don't you write something about us? ", he said. I felt uncomfortable for a moment but knowing it could give hope and encouragement to childless couples, I decided to share with you on how 2 years after marriage we were finally blessed with a son and 6 years after, a daughter followed. I went steady with hubby Dong for 8 years. We got married when I turned 27. I knew we needed to immediately start a family because my biological clock is ticking. However, we were not as lucky as others. I had a miscarriage before my son. My mother also had miscarriages due to low placenta so I believe I could have inherited it from her. For two years, we were trying to conceive but to no avail. During our 2nd yr of marriage, my husband was invited by peers to join Brotherhood of Christian Businessmen and Professionals (BCBP) Las Pinas chapter. We attended the weekly formation sessions and offered our fervent wish to have a child during prayer intentions. The community also prayed for us. The chain of prayers must have really worked wonders for God immediately heeded our plea. On our 5th week in the formation, I was already conceiving. Imagine the joy in my heart upon confirming that I would be a mother soon. We named the baby boy John Christian because he is a proof of God's graciousness. Six years after the birth of my eldest, I was convinced that I could no longer bore another child due to some medical complications. Also, I had another miscarriage aside from I was in my mid-thirties already. However, God indeed is full of surprises. He gave us another child, a daughter we named Selena (a name insisted by her Kuya after we saw Selena Quintanella-Perez's filmbio on HBO) Therese (from my patron saint Therese of the Child Jesus). 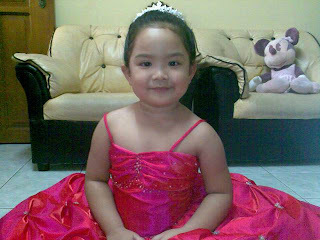 Now, John Christian (Jaycee) is turning 12 on December 20 and Selena Therese (Baby) recently turned 6 last May. Looking at them tonight as they peacefully sleep, I could not contain my happiness for having been blessed with well-mannered and God-fearing children. As they would frequently ask, "mommy, where did we come from"? My answer is always the same and definite: "YOU ARE BLESSINGS FROM GOD!" One of mama's legacies is her ability to cook dishes from scratch. She was known as a good cook in the neighborhood although my father is into cooking, too. When I was young, I remembered how a sumptuous meal would be served out of anything that she could find in the kitchen. No matter how simple our meals were, it was always such a pleasure to eat because it was a product of a mother's love. It is just unfortunate that I can no longer taste her cooking. She died at 58 in 2000. Now that I am a mother, I am striving to continue my mother's legacy. At least, I have 2 kids who are a fan (no choice!!!) and a hubby who enjoys good food (you must see him to believe). Today is one of those days that they get to sample their all-time favorite---what else to demand for but the never-ending SPAGHETTI. It put a smile on my face when I heard my little Selena asking her Kuya Jaycee this morning, "spaghetti, you like?" (trying to mimic one of the commercials for a spaghetti sauce). Her Kuya answered, "is it sweet?" and they continued to depict the commercial scene to my hubby's delight. Like Mama, I can also cook meals from anything that I can find in the kitchen. I have a spaghetti leftover from New year (at least, expiration is not yet due soon he!he! ), minimal portion of ground beef from last week's menu, stock of liver's spread, button mushroom and tomato catsup. All I need to buy from the neighborhood store (just fortunate that they're well-stocked) is the spaghetti sauce from the commercial (due to insistent demand of 2 kids who patronize every product they see on tv ads). Lunch came and all were in unison, "thanks mommy, it is sooooo yummy!" 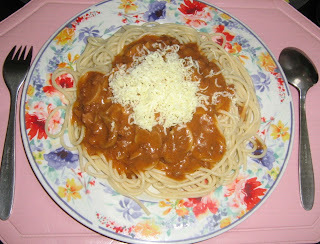 So let me share with you a simple spaghetti recipe that you can cook to delight the whole family. Try it to believe how yummy it could be! 1. Heat butter. Saute garlic and onion. 2. Add ground beef. Place liver spread when beef turns brown. 3. Add spaghetti sauce and catsup. Add half of cheese. Simmer. 4. Place button mushroom. Add condensed milk when almost done. 6. Pour spaghetti sauce over cooked spaghetti. Sprinkle with cheese.